With a wave of the tail fluke, this humpback whale took a dive in front of a beautiful rocky shoreline making for some great scenic pictures. This picture shows natural forest on shore and the calm waters of Johnstone Strait, mixed with a graceful rise of this whale tail. I like to shoot scenic pictures of wildlife with natural, beautiful scenery as the backdrop. 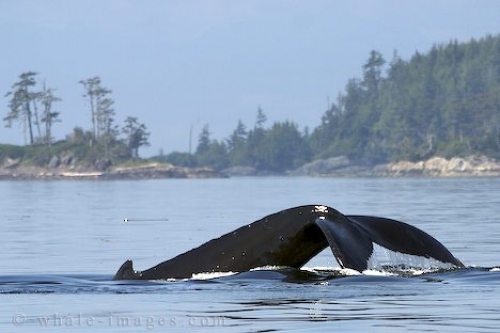 Scenic Picture of a little Island and a Humpback Whale lifting its tail up, British Columbia, Canada.